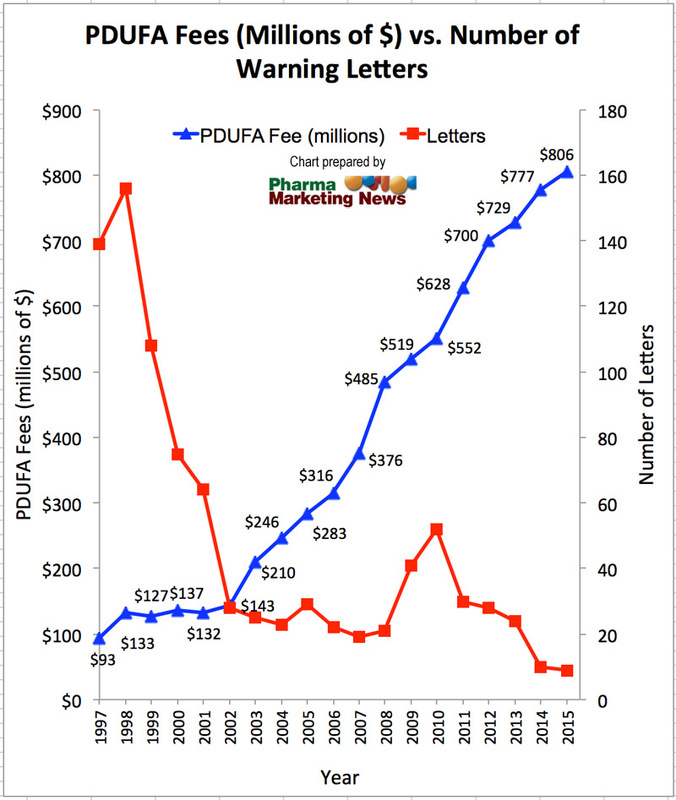 Pharma Marketing Blog: Why Is FDA Issuing Fewer Marketing Violation Letters? Why Is FDA Issuing Fewer Marketing Violation Letters? As mentioned in a previous Pharma Marketing Blog post, the FDA's Office of Prescription Drug Promotion (OPDP) issued the fewest ever enforcement letters regarding non-biologic Rx drug promotions in 2015 (read "2015 Was Another Good Year for Orphan Drugs & Pharma Marketers"). 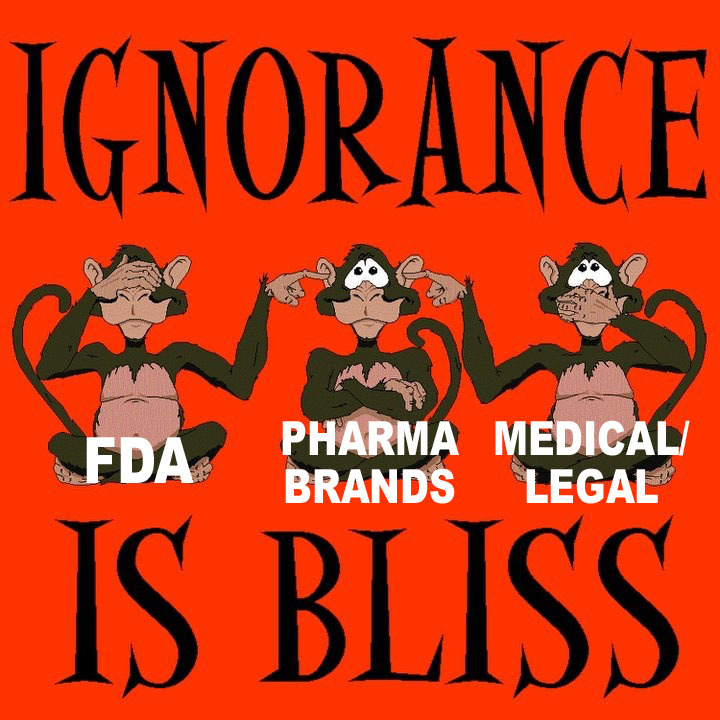 Senak noted that these days "letters largely involved companies that are lesser known and are likely to have fewer products on the market," which implies that they have less experience complying with FDA regulations whereas larger pharma companies are becoming better at complying with FDA regulations. A Pharmalot blog post also suggested that "smaller drug makers [are] bigger risk takers when it comes to promotions" (see here). It is interesting that the pharma companies that received serious WARNING LETTERS as opposed to less serious UNTITLED LETTERS in 2015 were two small Canadian companies. One of these companies was Duchesnay which received a warning letter for the promotion of Diclegis via Instagram. It should be noted that an American agency was responsible for dreaming up the violative Instagram post. This agency claims to have a deep understanding of FDA regulations especially when it comes to social media. For more on that, read "How Kim Kardashian Got Hired to Shill for Diclegis". Senak has another, more interesting theory. But I can trump that with a totally different theory based on the tried and true investigative journalistic axiom; i.e., "Follow the Money." Another theory suggested by Senak is that the decline may "reflect the FDA’s 'unfinished work' in formulating guidelines for digital media" and that this "has flummoxed drug makers, who are grappling with ways to harness social media to reach consumers while trying to avoid regulatory infractions" (reported here). It's true that many pharma companies are shying away from social media where it is more likely to run afoul of the FDA than on more traditional media where they have more guidance from FDA. Read, for example, "#Pharma Lacks Commitment To Do Facebook Well" and "#Pharma Brands Simply Do NOT Listen to Consumers on Social Media". But there has been several instances of "received wisdom" from the FDA about how drug companies can remain compliant when using social media for promotion. This includes specific guidances as well as lessons learned from letters such as the one sent to Duchesnay. What more guidance is needed? How to link to other sites? That's about the only piece of promised guidance missing. But it's an issue already solved by the drug industry and requires no further guidance from the FDA. FDA adverse-event (AE) reporting requirements have often been cited as a major impediment hindering pharmaceutical companies from sponsoring or creating truly open-ended social networking communities, even if they are not product related. Social media advocates, however, have long suggested that it is possible to handle any adverse events reported on pharma-sponsored sites and at least one pharma company has not been afraid to do it (read "Active Social Media Listening: UCB's Approach for Achieving Better Patient Experiences"). 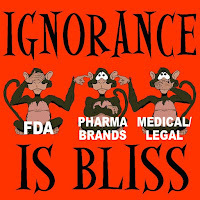 Pharma marketers are not "flummoxed" by FDA's inaction - there has been action as I just noted. The drug industry simply won't commit the resources/commitment necessary to fully utilize social media for marketing purposes (op cit). Click for enlarged view. Source: FDA. 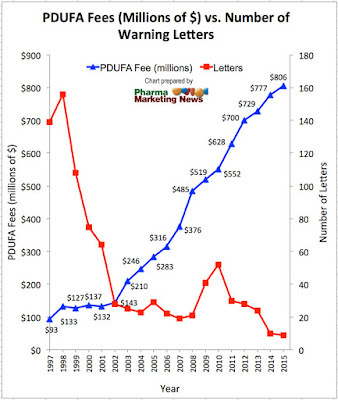 For 2015 PDUFA fee number: "Prescription Drug User Fee Rates for Fiscal Year 2015"
After 2002, when PDUFA fees really started to shoot up, the number of warning letters issued per year was significantly less than in previous years. NOTE: In 2001 FDA's Chief Counsel at the time was Bush-appointed Daniel E. Troy, who instituted a legal review of regulatory letters before they were issued and this policy change effectively hobbled the issuance of these letters by the FDA. Hence, fewer warning letters beginning in 2001/2.